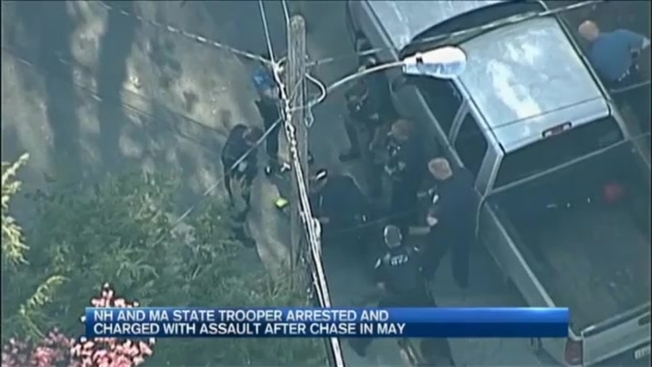 A trial was scheduled to get underway Tuesday for a Massachusetts State Police trooper accused of beating a suspect in New Hampshire last year following a pursuit filmed by a TV news helicopter. Joseph Flynn pleaded not guilty to simple assault charges in the arrest of Richard Simone Jr. Prosecutors allege the 33-year-old Flynn punched Simone, who was kneeling to surrender following the chase in May 2016. Flynn's lawyer said his client's use of force was justified. The chase began in Holden, Massachusetts, after Simone refused to stop. Prosecutors wanted to exclude some video of the pursuit, saying it was irrelevant and would appeal to a jury's sympathy for Flynn. A judge disagreed, but ruled to exclude some dash camera video from another trooper before the pursuit.